The Council does not provide a treatment service for this particular pest but are happy to provide the public with general advice. 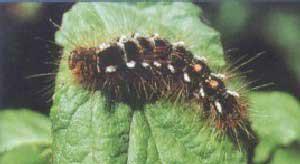 The Brown Tail Moth is found in considerable numbers along the coast of South Eastern England and is particularly active from late spring to early June. Below is some general advice on how you can help to limit its spread and prevent you and your family suffering from the painful rash that the moth’s caterpillars can cause. The control and treatment of the brown tailed moth is generally not an environmental health issue and we do not provide a treatment service. We can however provide advice. If you require a treatment we advise that you contact a private pest control contractor. What makes the Brown Tail Moth Caterpillar a pest? The caterpillars emerge in spring and begin to eat the buds and leaves of many species of tree and shrub, in severe cases causing total defoliation before they move to other plants to continue feeding. Generally, most plants will re-flush by July and not be totally lost. The caterpillars carry up to two million spiked and barbed hairs, which can penetrate skin, causing an irritant reaction. For asthmatics and hay fever sufferers, it is important to avoid inhaling the hairs which may cause severe breathing difficulties. How do I know if I have them on my property? A good time to note if the caterpillars are present is in the winter after leaf fall. It may be noticed that silken tents are attached to small branches in the crown of your tree and in which up to 2000 caterpillars may be sheltering. It is at this time that pruning out the tents and burning them can be the safest and most effective form of control. From spring the caterpillars become active and may be seen on the branches of trees and shrubs with a preference for hawthorn and blackberry. They are between 7mm and 38mm in length (depending on age) and are dark brown in colour with a distinct white line down each side. The whole body is covered in tufts of brown hairs and two distinct orange/red dots are noticeable on the caterpillars back towards the tail. Great care should be taken to avoid touching the caterpillars and in cases of large infestations it would be wise to keep windows closed to prevent caterpillars entering into your house. The only certain way of eliminating any infestation is by pruning out and burning the tents during the autumn/winter period when the caterpillars are sheltered within. During the summer months when the caterpillars are active, contact chemical sprays may give some immediate control, but as only some 10% of the caterpillars leave the confines of the tents at most times, this is not an effective option overall. What is necessary is a residual poison which can adhere to the leaves of the tree so that as the caterpillars venture out the means of control is in place to eliminate them over a prolonged period. Yes, but there is a risk of doing so and precautions must be taken. Many of the irritant hairs from the caterpillars are bound up in the tents and can easily be detached when these are pruned out. If you are uncertain of the chemicals to use and are not aware of the safety and application requirements, do not attempt to use chemical control. If you are happy to undertake this, various pesticides are available from most good garden centres where further advice can also be sought. It is important to closely follow the manufacturer’s methods of application and to use protective clothing fully. Wear strong, impervious protective clothing, preferably garments that can be made tight at the cuffs and ankles and can be either boiled or disposed of after use. Cover as much of your bare skin as possible by wearing gloves, a hood, boots, goggles and a respirator or dust mask. If you are using a ladder, get someone to hold it steady. Carefully remove the tents with secateurs from the tree or shrub by cutting the branch or twig to which it is attached. Place in plastic bags (one inside a second), seal tightly and put in refuse bin. are not comfortable working at heights. If the infestation is of such a size or location that considerable disturbance of the tents is inevitable, it would not be wise to deal with the problem yourself. What if I get a rash? Avoidance is far better than cure and following the previous recommendations will help to ensure that you are not affected. If you are unfortunate enough to come into contact with the hairs you can expect a rash together with irritation similar to a severe nettle rash. Normally this will give a few hours of localised discomfort, and a warm bath, the application of calamine lotion or antihistamine creams may ease the itching. If any other symptoms are experienced or the irritation persists, medical advice should be sought without delay. If you are a tenant contact your landlord or managing agent. In extreme situations the Council may assist with treatments but a charge will be made to fully recover the costs which could be significant. If you have an infestation in a tree on which legal restrictions such as a Tree Preservation Order or Conservation Area apply, you are recommended to gain advice from an Arboriculturist prior to undertaking any action.